Some of your favorite superheroines from DC Comics are found in a retro style with Funko DC Bombshells Mystery Minis. Featured in a 1940s pin-up design, the unique look gives extra depth and personality to the well-known comic characters. 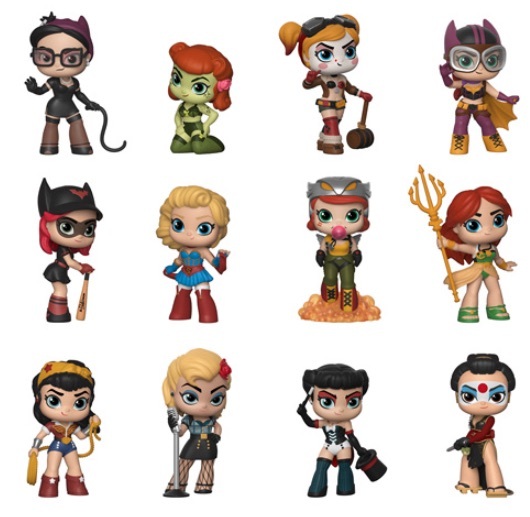 Offering DC legends such as Wonder Woman, Harley Quinn and Supergirl, the Funko DC Bombshells Mystery Minis lineup is issued in a blind-box format, which means the exact figure is a surprise. However, since they are all found at 1:12 boxes, building a complete set is not quite as tough as some of the other Mystery Minis releases. Buy DC Bombshells Mystery Minis Boxes on Amazon. One thing to note is that the Specialty Series format has three exclusive figures that are not available anywhere else. These cases are provided to local stores and small online retailers. The exclusive trio includes Green Lantern, Raven and Starfire. As a result, that should mean a total of 15 figures in the set unless there are unannounced exclusives. In addition to the miniature figures, collectors can check out the larger Funko Pop DC Bombshells vinyls, plus a DC Bombshells trading card set from Cryptozoic. Shop DC Bombshells Mystery Minis Cases on Entertainment Earth.